Smoke Fairies cover the Christmas carol 'I Wonder As I Wander' on the B-side of their Snowflakes Christmas single. This song has been recorded by many other artists and bands, although only very few of these cover versions appeared on a 7”, and, as far as I have been able to track down, only in one instance, the song was the A side. This was a single by Muriel Smith, released in 1963 in the United Kingdom on the Philips label. The song has a long history. Although it is generally believed that this song is a traditional, in fact, this is not the case. The version of 'I Wonder As I Wander' as we know it now, was written by John Jacob Niles, a folklorist and singer from Louisville, Kentucky. But he did base the song on an existing folk song. On July 16, 1933, John Jacob Niles visited the mountain town Murphy, located deep in the Appalachian mountains of North Carolina. There he witnessed a fundraising meeting of a group of evangelicals, who had been ordered out of town by the police. A girl, according to the account of Niles, “unwashed, in unbelievable dirty and ragged clothes, with ash-blond hair that hung down in long skeins, but still very beautiful”, stepped out to the edge of a little platform, attached to the automobile of the evangelists. The girl, Annie Morgan, sang a small fragment of a song, and repeated the fragment seven times (note the symbolism!) in exchange for a quarter per perfomance. Inspired by this performance, Niles decided to write a song based on the lines and melody he had heard the girl sing. He completed the song, that he titled 'I Wonder As I Wander' on October 4, 1933 and first performed it on December 19, 1933 at the John C. Campbell Folk School in Brasstown, North Carolina. In 1934, the song was published in Songs Of The Hill Folk. Many performers and listeners mistook the song as a traditional, anonymous in origin. Niles had to undertake several lawsuits to establish its authorship and demand royalties of other performers. Niles wrote the song as a more general Christian hymn. The first verse speaks about how Christ the Savior died for the poor people. Only in the second verse there is a link to Christmas: “When Mary birthed Jesus 'twas in a cow's stall – With wise men and famers and shepherds and all – But high from God's heaven, a star's light did fall – And the promise of ages it then did recall.” The third verse celebrates Jesus as the King, and after that, the first verse is repeated again. The fact that the song is more about Jesus as the Savior than about Christmas did not prevent the song to be considered as a Christmas carol by many, and also its inclusion on many Christmas albums. The only time the song was used as the A-side of a 7” was in 1963, in a version by American singer Muriel Smith. Smith was born in New York. She was the first African-American to study at the Curtis Institute Of Music in Philadelphia and graduated in 1946, in the same class as Leonard Bernstein and Isaac Stern. She made her debut on Broadway in December 1943, in Carmen Jones, playing the title role. Muriel appeared in some other musicals and stage plays, before moving to London in 1949. She played several roles in London musicals, and in 1953 had a #3 hit with 'Hold Me, Thrill Me, Kiss Me' single in the UK. Muriel returned to the USA in 1955, to play in the revival production of Carmen Jones. The following year she was back in London, now starring as Carmen at the Royal Opera House, her first role in a more traditional opera. In the fifties, she also could could be heard as a ghost singer in several Hollywood movies, most notably in 1958's South Pacific, where she dubbed 'Bali Ha'i' and 'Happy Talk' for actor Juanita Hall. 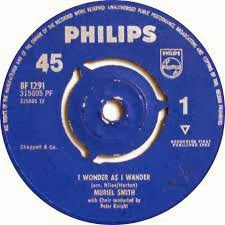 Although 'I Wonder As I Wander' was released in the UK as a 7” in 1963, the recording was not new, as it had already been included on the 1960 Christmas album 'The Glory Of Christmas', that was released both in the UK and the USA (on the Philips label). The album was recorded in the UK, and Muriel was accompanied by the British conductor and composer Peter Knight, his orchestra and chorus on the record. Muriel was a soprano, and that is also how she sang 'I Wonder As I Wander', making the song almost like a part from an opera. On the B-side was another song of her album, 'Sweet Little Jesus Boy'. 'I Wonder As I Wander' has been recorded by many artists, especially from the 1950s on. More known performers who recorded the song include Burl Ives (1953), Percy Faith (1954), Jo Stafford (1955), Hugh Downs (1959), Cort Johnson (1963), Joan Baez (1966), Julie Andrews (1975), George Beverly Shea (1980), James Galway (1986), Vanessa Williams (1996), Jewel (1999), Linda Ronstadt (2000), Harry Connick, Jr. (2003), Gladys Knight (2006) and Oleta Adams (2006). The song has also appeared as the B-side on several 7”s. Burl Ives recorded the song in 1953, and it appeared on a 4 song EP on Decca Records. it was also the B-side to Christian singer Bill McVey's 'Abide With Me'. The same year as the Muriel Smith version was released on 7”, the song also appeared on a Dutch 7” of gospel singer Mahalia Jackson, B-side to 'The Holy Babe', although also she recorded the song several years earlier, as it also already appeared the 1961 'The Holy Babe of Bethlehem' 7” EP. In 1965 Cy Grant recorded it for the B-side of the single 'The Lord's Prayer'. Funny enough, two years later Barbara Streisand combined the same two songs on a 7” on Columbia Records. To my knowledge, this was the last time the song has appeared on a 7”. And now, 46 years later, it is available again on a 45, in a beautiful and haunting version.